Hi! 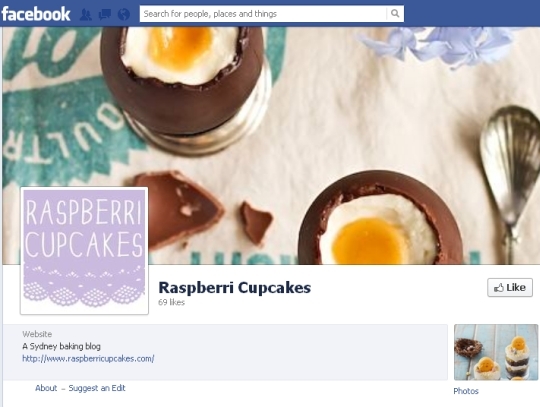 Just a quick note to let you know that by popular demand, I have FINALLY set up a Facebook page for raspberri cupcakes! Yay! Yeah I know, it's about 3 years too late but I honestly thought I would never do it since I am a bit wary of Facebook. I know a lot of you had asked me to make the page for a while now and I finally caved because I wanted to make sure there's plenty of options for everyone to get updated when I post a new recipe. Of course you can still subscribe via e-mail or rss to get my new posts, but now you can also LIKE my facebook page too! So please go and like away! I will try my best to keep it updated regularly with plenty of good shizz.